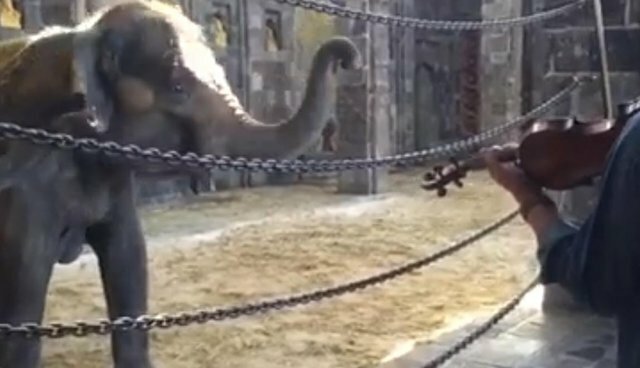 A beautiful yet heartrending video showing musicians playing classical music to a group of captive elephants is leaving some people weeping. In the footage, two musicians at the award-winning Pairi Daiza zoo play an excerpt from Handel's Harpsichord Suite No. 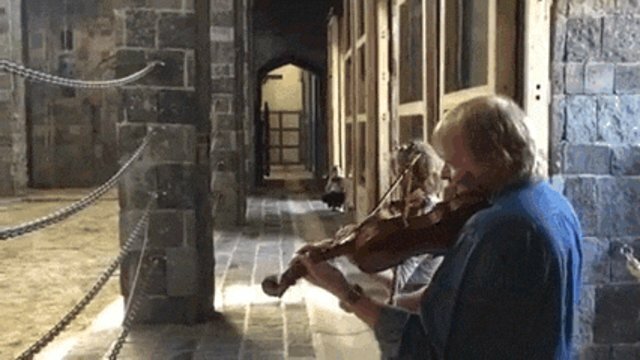 7 in G Minor, and then one from Vivaldi's "Summer." A small group of zoo elephants - separated from the musicians by a chained fence - lift their trunks, "in a periscope-sniff trying to learn more about the people and what's going on," according to Joyce Poole, the founder of Elephant Voices, a Kenya-based group that studies elephant communication, cognition and social behavior. Initially, says Poole, "the elephants are swaying back and forth, which is stereotypic behavior, and a young elephant reaches its trunk into the mouth of an older elephant and is given a reassuring touch." As the rhythm picks up, one of the elephants chirps in apparent excitement, Poole notes: "The elephants then stand still and listen attentively to the music. "Pairi Daiza"Elephants have complex vocal communication and produce a large repertoire of sounds. They are also capable of vocal learning, meaning that they can imitate sounds and produce novel sounds," Poole told The Dodo. "This capacity may be related to their apparent interest in the music. "Over the years, Poole says she has witnessed elephants in the wild respond to music - from her own singing to a friend's guitar playing. "In both cases, elephants gathered around my car and listened quietly," she says.Pairi DaizaOn another occasion, during a New Year's Eve celebration at a lodge, "We looked out into the shadows and a family of elephants was listening [to our music]," she notes.Sharon Pincott, a conservationist who spent 13 years observing the famous Presidential Elephant herd in Zimbabwe, says she has also observed elephants responding to music. "One day, I sang the first verse of 'Amazing Grace' over and over and over again. The elephants crossed their back legs and rested their trunks in an L shape on the ground - a sure sign that they were particularly relaxed," she says. "As the months and years passed, the elephants would choose to congregate around my vehicle for lengthier periods of time, as I talked and sang to them. "Sometimes, says Pincott, "I'd let the instrumental from the movie 'Out of Africa' - 'I Had a Farm in Africa' – ring out from my laptop in the sunset. And I'd have a whole family of wild, free-roaming elephants surrounding me, with their trunks propped up on my car roof, silently listening to the music. "Although the elephants respond so movingly to the classical music, Poole notes that this acoustic attunement provides yet "another reason why captivity does not suit them well. "The fact that the elephants are in a zoo, infused with so much depth and sensitivity, is not lost on some viewers: "So beautiful, so haunting," wrote one person on Facebook. "[It] brought tears to my eyes. "Watch the heartbreaking video here:CLARIFICATION: This story has been updated to provide a more detailed version of Joyce Poole's analysis of the video. 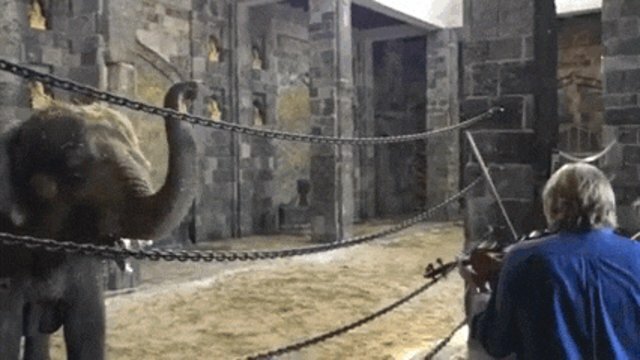 As the rhythm picks up, one of the elephants chirps in apparent excitement, Poole notes: "The elephants then stand still and listen attentively to the music." Pairi Daiza"Elephants have complex vocal communication and produce a large repertoire of sounds. They are also capable of vocal learning, meaning that they can imitate sounds and produce novel sounds," Poole told The Dodo. "This capacity may be related to their apparent interest in the music. "Over the years, Poole says she has witnessed elephants in the wild respond to music - from her own singing to a friend's guitar playing. "In both cases, elephants gathered around my car and listened quietly," she says.Pairi DaizaOn another occasion, during a New Year's Eve celebration at a lodge, "We looked out into the shadows and a family of elephants was listening [to our music]," she notes.Sharon Pincott, a conservationist who spent 13 years observing the famous Presidential Elephant herd in Zimbabwe, says she has also observed elephants responding to music. "One day, I sang the first verse of 'Amazing Grace' over and over and over again. The elephants crossed their back legs and rested their trunks in an L shape on the ground - a sure sign that they were particularly relaxed," she says. "As the months and years passed, the elephants would choose to congregate around my vehicle for lengthier periods of time, as I talked and sang to them. "Sometimes, says Pincott, "I'd let the instrumental from the movie 'Out of Africa' - 'I Had a Farm in Africa' – ring out from my laptop in the sunset. And I'd have a whole family of wild, free-roaming elephants surrounding me, with their trunks propped up on my car roof, silently listening to the music. "Although the elephants respond so movingly to the classical music, Poole notes that this acoustic attunement provides yet "another reason why captivity does not suit them well. "The fact that the elephants are in a zoo, infused with so much depth and sensitivity, is not lost on some viewers: "So beautiful, so haunting," wrote one person on Facebook. "[It] brought tears to my eyes. "Watch the heartbreaking video here:CLARIFICATION: This story has been updated to provide a more detailed version of Joyce Poole's analysis of the video. "Elephants have complex vocal communication and produce a large repertoire of sounds. They are also capable of vocal learning, meaning that they can imitate sounds and produce novel sounds," Poole told The Dodo. "This capacity may be related to their apparent interest in the music." Over the years, Poole says she has witnessed elephants in the wild respond to music - from her own singing to a friend's guitar playing. "In both cases, elephants gathered around my car and listened quietly," she says. On another occasion, during a New Year's Eve celebration at a lodge, "We looked out into the shadows and a family of elephants was listening [to our music]," she notes. Sharon Pincott, a conservationist who spent 13 years observing the famous Presidential Elephant herd in Zimbabwe, says she has also observed elephants responding to music. "One day, I sang the first verse of 'Amazing Grace' over and over and over again. The elephants crossed their back legs and rested their trunks in an L shape on the ground - a sure sign that they were particularly relaxed," she says. "As the months and years passed, the elephants would choose to congregate around my vehicle for lengthier periods of time, as I talked and sang to them." Sometimes, says Pincott, "I'd let the instrumental from the movie 'Out of Africa' - 'I Had a Farm in Africa' – ring out from my laptop in the sunset. And I'd have a whole family of wild, free-roaming elephants surrounding me, with their trunks propped up on my car roof, silently listening to the music." Although the elephants respond so movingly to the classical music, Poole notes that this acoustic attunement provides yet "another reason why captivity does not suit them well." The fact that the elephants are in a zoo, infused with so much depth and sensitivity, is not lost on some viewers: "So beautiful, so haunting," wrote one person on Facebook. "[It] brought tears to my eyes." CLARIFICATION: This story has been updated to provide a more detailed version of Joyce Poole's analysis of the video.